After the revised SI goes into effect, consumers shouldn't expect to use a Kibble balance to weigh their bananas at the supermarket. But the changes will be useful to many industries, particularly those doing cutting-edge research with very small or very large masses. 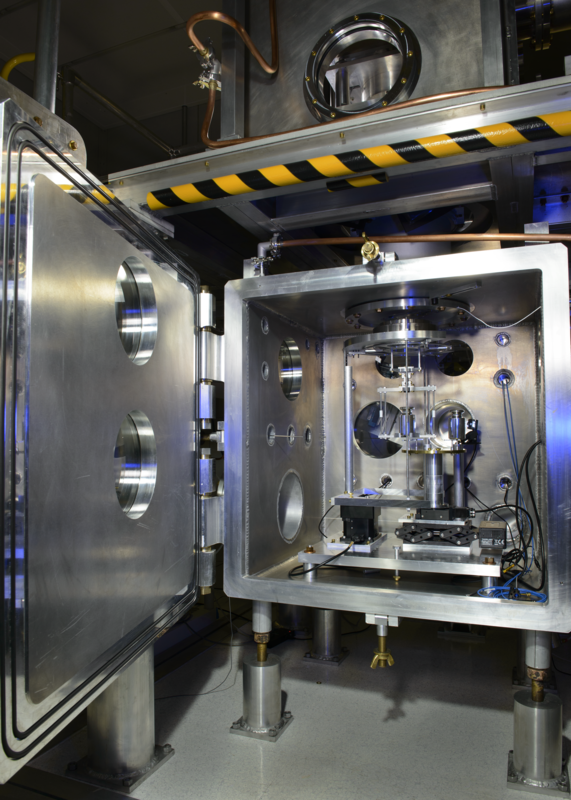 To maximize these benefits, measurement scientists are developing new tools to reduce the uncertainties involved in disseminating the value of the kilogram to their customers. Mass-measurement capabilities these days are much more sensitive than required for most purposes. Measurement scientists at NIST and other national metrology institutes are currently able to measure a kg mass to one part in ten billion, which amounts to a resolution of just 0.1 millionths of a gram (micrograms), a fraction of the mass of a single eyelash. That level of accuracy is definitely not needed to see if you’re gaining or losing weight, or to weigh your produce at the supermarket. But cutting-edge work in fields such as forensics, pharmaceuticals and experimental physics can benefit from mass measurements with even higher precision or “resolution.” And since mass is also part of the definition of other quantities, such as force, energy and power, a higher-resolution kilogram will have an effect on a whole range of measurements beyond just mass. NIST’s Patrick Abbott with one of the instruments used in studies of vacuum-to-air mass comparators that will help disseminate mass standards to customers in industry. In the present system, accurately comparing a very small mass — say 1 milligram — to the kilogram standard is a multi-step process. Uncertainties compound at every stage. Measurement scientists must begin with a kilogram artifact and make a series of comparisons, starting with weights closest in mass to the kilogram and work downward. Even with its shortcomings, the present system enables highly accurate measurements that have been hard to beat. In the current SI, the International Prototype Kilogram (IPK) outside Paris has an uncertainty of exactly 0 by definition. Comparing one of the IPK's sister copies to a national prototype (such as the U.S.'s K20) entails an uncertainty of about 3.5 micrograms (millions of a gram). By the time measurement scientists are calibrating customers' weights, uncertainties are around 20 micrograms for a kg. In the SI redefinition, it will be the constants that are exactly defined, assigned zero uncertainty by definition. A primary kg-to-kg measurement with the NIST Kibble balance is initially expected to yield a higher uncertainty than the present system, around 13 micrograms at the kg level. But that's good enough for most purposes, and that's also just a starting point; the uncertainties are likely to decrease as the techniques improve. And a redefined kilogram comes with its other advantages right out of the gate, such as better scalability and being able to compare masses to a primary kilogram standard without having to travel to an artifact at a distant location. With the ability to make direct comparisons between the Planck constant and mass, researchers won't be forced to begin with the kilogram on their way to a tenth of a microgram or to 10,000 kilograms: the Planck constant will take them there directly. This means that the primary realizations of very large and very small masses could have much lower uncertainties than they have now. This is accomplished at NIST using an electrostatic force balance for the primary realization of masses in the range of 50 micrograms to 30 milligrams. Top: Gordon Shaw with the electrostatic force balance (EFB) designed for measuring small masses. Bottom: Close-up of the front of the EFB. Researchers can measure small masses by placing them in the small copper-colored, hook-shaped pan at the top of the instrument. Once researchers have a new definition of the kilogram, they will still need to disseminate it via physical artifacts called "transfer standards" to customers in industry, academia and government. However, the methods used to realize the redefined kilogram require a vacuum, while the transfer standards must be deployed in air. A new mass comparator developed at NIST may improve this transfer process by permitting scientists to do something they've never done before: make direct measurements between a mass in vacuum and a mass in air. Two masses in a vacuum are relatively easy to compare. But in air, an artifact's measured mass is affected by air buoyancy as well as the amount of water and other contaminants adsorbed onto its surface. Scientists can correct for these factors by precisely determining the volume of the mass and the pressure, temperature and humidity of the air. Then, using models that take the surface properties of the material into account, they can compare an artifact's mass in a vacuum to its mass in air, factoring in uncertainties for each stage of the measurement. The new balancing method, on the other hand, aims to minimize uncertainties because its calibrations will not depend on the type of material or assumptions about its adsorption characteristics. About the size of two refrigerators stacked on top of one another, the new device consists of two enclosures separated by an airtight barrier. At the top is a vacuum chamber containing a sophisticated mass comparator capable of resolving a difference of 10 micrograms out of a kilogram, or 10 parts in 109. At the bottom is an air chamber, which houses the mass artifact to be calibrated. Hanging just above the floor of the upper vacuum chamber is a combination of a permanent magnet and a solenoid, a coil of wire that produces a magnetic field when current runs through it. Below, in the air chamber, another permanent magnet is affixed to the top of the platform or "carriage" holding the mass artifact. Mass comparator built and tested at NIST. The mass comparator’s lower chamber, where the mass artifact is calibrated. To do a calibration, researchers raise the platform in the bottom chamber until the poles of the two magnets are the correct distance apart (typically in the range of 20–30 mm). Then they let the carriage go. Magnetic attraction causes both the platform and the mass it supports to levitate, rising or falling to a position where the magnetic pull upward equals the weights of the suspended objects. Using the solenoid, researchers can tweak the magnetic field to stabilize the levitation. In the new system, a primary realization of the kilogram could be calibrated in the Kibble balance using a transportable vacuum compartment, which could then be removed, transferred, and inserted into the top chamber of the new vacuum-to-air comparator without exposing the mass to air. 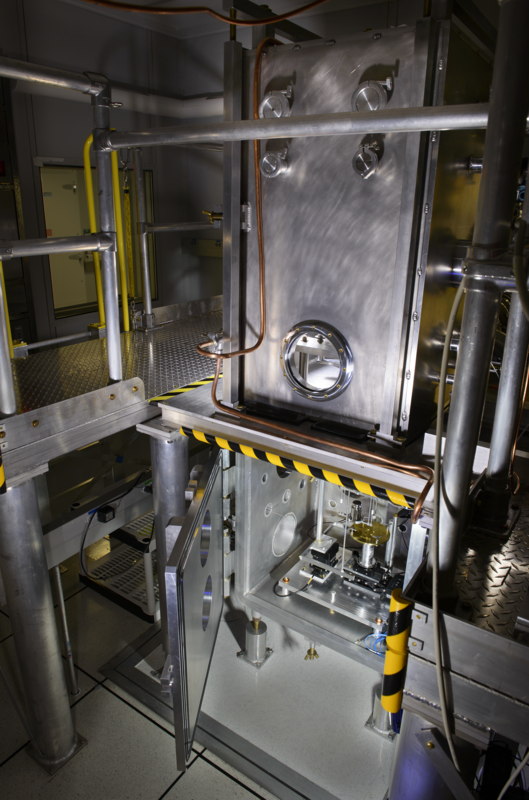 After the kilogram is redefined in 2018, NIST researchers will use the NIST-4 watt balance to translate the new definition to a physical object, which makes it possible to distribute the new standard to the laboratories and industries that need it. Mass standards that are calibrated in the watt balance will need to be kept permanently in vacuum, to avoid the instabilities in mass that can occur when a standard is exposed to air. 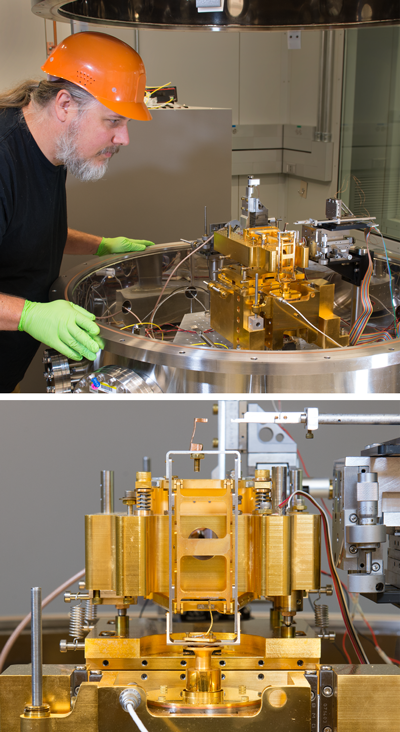 Here, NIST researchers demonstrate how a sample kilogram mass is transferred from the watt balance to the small vehicle that will carry that standard, still safely in vacuum, to a mass comparator, which is the next stage in the process of disseminating the new kilogram definition. Note: In this demo, the vacuum cap has been removed from watt balance to make the process visible. Most clips sped up 5x normal speed. All sound effects added; the actual process is extremely quiet.